Despite the ferocious winters that the Soviet Union knew all too well, the ordinary soldier of the Red Army was not well equipped for a winter war when he was sent into Finland in late 1939. Thousands died of the cold, and while the war achieved little and cost the USSR dear it did at least highlight the need for better winter clothing for the troops. Naturally the German invasion of 1941 disrupted improvements, but gradually better garments did appear, and as the war progressed the Soviet soldier became ever better prepared for winter fighting. All the figures in this set are clothed in a virtually identical manner. All the troops wear the ushanka, a very warm and practical hat that continues to be popular in cold climates to this day and was first issued to the Soviet military in 1940. The rest of the uniform is made up of the telogreika quilted jacket and matching trousers, which were first introduced in 1941 and had become so common two years later that they were sometimes seen worn in relatively temperate weather. All the figures wear short boots, which are not wrong but not the best choice in our view. We would have much preferred that the figures wear valenki, which were traditional felt boots that protected from the cold very effectively and were widely worn by the troops. The military issue of this boot covered the whole leg below the knee, and was very often worn along with the telogreika. Finally the officer wears a peaked cap, which is much more of a summer garment (after all officers feel the cold as much as everyone else), although of course not impossible in cold weather. Still officers generally wore a better quality Ushanka in such circumstances and while this would make the officer hard to spot in this set it would still have been a more accurate choice. The figures carry relatively little kit, with most only having one item of the many that they would normally carry. While there were always shortages and difficulties of supply, by the time this sort of uniform was widespread such problems were not acute so we felt the men should have been better endowed than they are. Such items as are on display are correctly done, however. Weaponry is mainly the Mosin-Nagant rifle plus two poses using the famous PPSh-41 sub-machine gun. 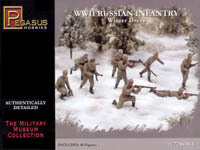 Later in the war the PPSh-41 was used in millions and could usefully have been more prominent in this set too. The officer handles what looks like a PPS-43 sub-machine gun, while a prone riflemen is using a DP-28 light machine gun (all Soviet infantry were termed 'riflemen' regardless of the weapon they carried). One weapon conspicuous by its absence is the bayonet, which was commonly fixed to the rifle at all times. While some figures could get away without such a device we felt the majority should have one. All the poses are useful and reasonable for the subject. Although none of the figures require any assembly (which is unusual for Pegasus) the poses are far from flat and look very natural. Sculpting too is very good, with all the detail such figures require. There is no flash and any line marking the join of the moulds is mostly minimal, but the one-piece nature of the figures means there are some very small areas of extra plastic in the usual areas where the mould cannot reach. Nonetheless this is clearly a quality piece of work and the figures look good. Any soldier will tell you that the difference between what is supposed to happen and what actually happens can be vast, and frequently Soviet soldiers had to use civilian items to keep warm when official supply failed. In addition other winter garments were also widely worn such as the greatcoat and snow camouflage suits, while helmets were sometimes worn despite their lack of good thermal properties. In short then this is far from a representative picture of Soviet infantry in winter weather, but there are other sets (listed below) which depict some of the clothing lacking here, so when seen as an addition to those sets all the figures in this set are pretty accurate (if a bit light on equipment) and very useful for all those winter battles up to 1945.